Mar - 25 | By: Oregon Film | one comment. 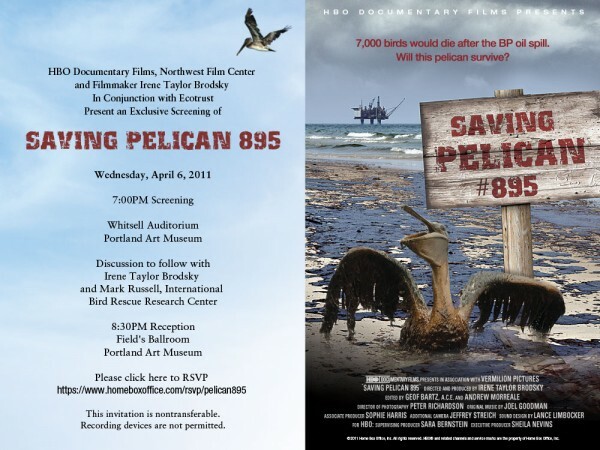 The Northwest Film Center is proud to present SAVING PELICAN 895 directed by Irene Taylor Brodsky (THE FINAL INCH, HEAR AND NOW), as part of the Film Center’s ongoing Northwest Tracking series, showcasing work by filmmakers of the great Northwest. This corner of the country continues to demonstrate filmmaking worthy of international screens in a wide variety of styles and stories. SAVING PELICAN 895 with director Irene Taylor Brodsky in attendance. Reception and discussion to follow the film at 8:30 p.m. in the Portland Art Museum’s Field’s Ballroom (1119 SW Park Ave.). Special thanks to HBO Documentary Films and the International Bird Rescue Center. Co-sponsored by Ecotrust.